The mining boom is also rumbling through other northern states whose most dominant geographic feature are the two Sierra Madre mountain ranges –Occidental in the west and Oriental in the east - that run north-south through north-central Mexico. These include the border state of Coahuila and the northern arid states of Durango and Zacatecas, among others. Sonora leads Mexico in the number of mining permits and production. Reflecting the national trend, Canadian firms dominate the foreign mining sector, while the Mexico-based Grupo México is by the largest producer – mainly because of its copper and molybdenum mines and processing plants in the northern municipios of Cananea and Nacozari. From the beginning of post-Colombian history, mining has vied with agriculture has Sonora’s top wealth-producing industry. The political and economic elite of Sonora made their homes in the southeastern town of Álamos, the northernmost of the Spanish empire’s silver towns in Latin America. The ostentatious wealth and political power of Álamos would, however, not been possible without the bounty of the indigenous agricultural communities of the Sonora, Mayo, and Yaqui River basins that hugged the Sierra Madre Occidental to the north and those of the Yaqui and Mayo deltas to the northwest and west. Unlike the Spanish conquistadores, colonizers, and mining ventures, the Jesuit missionaries sought out the indigenous communities of Sonora because of their farming traditions and their belief that the Jesuits could improve their living conditions through improved farming techniques. The mining centers of Nueva Vizcaya (northern territory that encompassed Sonora) and the Jesuit missions (and the associated indigenous communities) experienced a complementary yet conflictive relationship. Complementary because the silver and gold mines depended on forced indigenous labor and on the food produced by the native communities. Conflictive because of Jesuit and indigenous resistance to the demands, taxes, and repression of the mining-based power centered in Álamos. As the political and economic power of the Jesuit missions grew – based largely on the agricultural wealth of their missions among indigenous communities – tensions mounted, leading to expulsion of the order in 1767 and the takeover by the more politically and economically compliant Franciscans of the Jesuit missions. In 1993, before the current mining boom took hold of Sonora, historian and geographer Robert C. West observed: “In eastern Sonora the ephemerality of the colonial mining centers in the mountains contrasts strongly with the permanence of the mission villages in the adjacent river valleys. 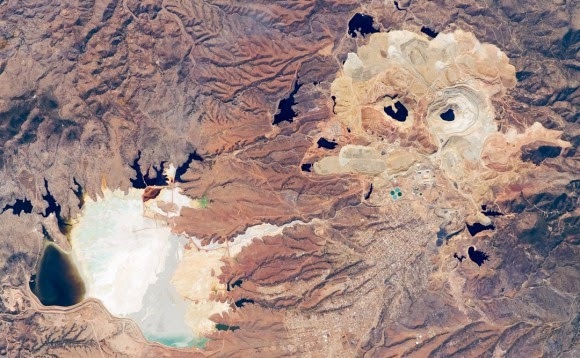 Over the past two decades, however, the new mining industry’s monstrous excavations and mountains of tailings, along with the associated environmental contamination and water consumption, have become the eastern Sonora’s most striking and alarming features of the landscape of this region known as La Serrana – the highlands in marked contrast to the Sonoran Desert and coastal plains. Servicio Geologico Mexicano, Anuario Estadístico de la Minería Mexicana; Servicio Geológico Mexicano, Panorama Minero del Estado de Sonora, 2013. Robert C. West, Sonora: Its Geographical Personality (Austin: University of Texas Press, 1993), pp. 53-55.